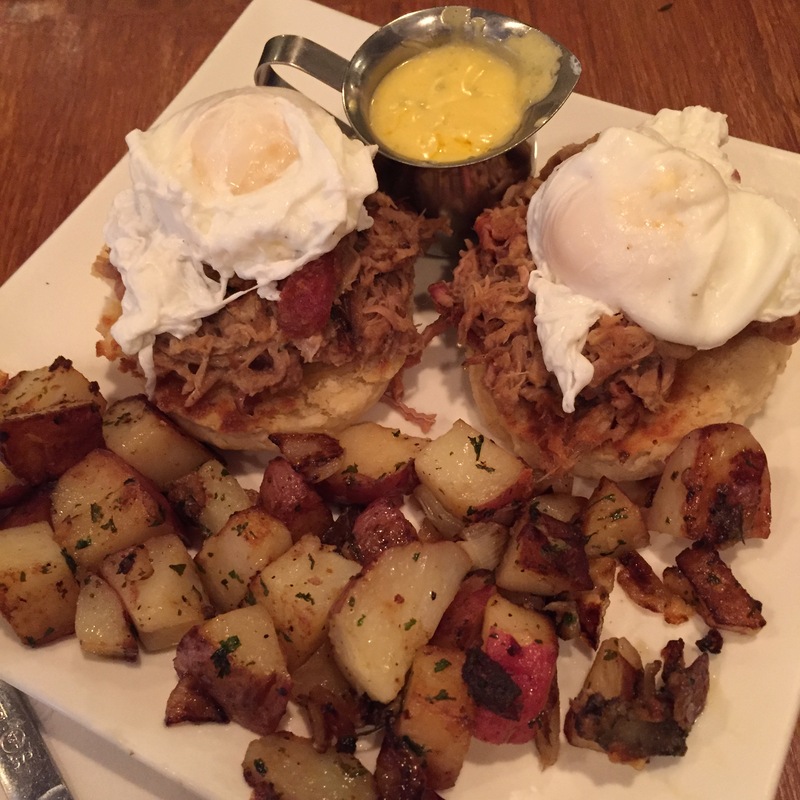 If you’re looking for breakfast in Baltimore, Spoons is where it’s at. While I’m not a huge breakfast person (and am afraid to admit that I really don’t like brunch), I’ve enjoyed some amazing meals at Spoons lately and I feel like every time I go I learn a new tip or trick so I thought I’d share them for today’s Friday five! Go early! As I mentioned I…ahem…don’t like brunch, so I don’t mind an early get together on the weekends. Spoons can have upwards of a 30 minute wait and they don’t take reservations, so if you want to beat the crowds, try to arrive by 9:30am. Skip the coffee…go for the espresso drinks. Hello you beautiful salted caramel latte. The coffee is OK, but the lattes and chais are amazing. Speaking of lattes, you can get your drinks to go! If you’re looking for a quick morning caffeine hit, head straight to the coffee bar and order your espresso drink to go. It’s about the same price as Starbucks and more delicious because it comes from your neighborhood joint. Don’t skip the O-nuts. Worth every calorie, these powdered sugar covered gems are Spoons’ twist on a traditional beignet. Deep fried and DELICIOUS. They come in perfectly small portions too- get 3 or 6. Spoons doesn’t have serve liquor so if you’re looking for the kind of brunch where you stuff your face and pound bloody mary’s, this probably isn’t the place for you. They do serve wine and champagne so you can get mimosas and bellinis (an cheap ones at that!). Spoons does have their own twist on a bloody – Asian-inspired and made with sake. It’s not bad, but no substitute for the real deal. You may notice that I didn’t even touch on the food and that’s because everything I’ve tried is delicious – you can’t go wrong! Most recently, we tried the hangtown fry: fried oysters over scrambled eggs with smoked paprika aoili. The oysters were fried perfectly and had amazing flavor that was enhanced by the mild sauce. They also have a build your own omelette or scramble option if none of the menu items are striking your fancy. I’ve designed myself a tasty egg white omelette chock full of veggies and gooey cheese. And the breakfast potatoes. For your choice of side, always go with the breakfast potatoes – so, so good! I mean, just look at that plate below. And wake up tomorrow morning and get yourself to Spoons. Stat. Highlights: Affordable breakfast entrees, sweet O-nuts and delicious espresso drinks. Happy Friday and happy March Madness! Go Terps! And because it’s Friday, we’re linking up with Heather, Mar, Cynthia and Courtney. Happy Thursday! We have almost made it through the week before Christmas – I don’t know about you, but things have been crazy busy in my office as we work to finalize a bunch of projects before the holidays. I’m actually heading to Boston today for a quick day trip for work which should be fun, but also a little stressful since it’s up and back in one day. Luckily, it’s not all work work work over here – we’ve also been doing a lot of cool stuff. Last weekend kicked off with the O’s holiday party. There was tasty food, open bar and casino games and all of the Orioles players attended who were in town for the weekend’s fan fest. Adam’s a big baseball fan and it was a really cool experience! 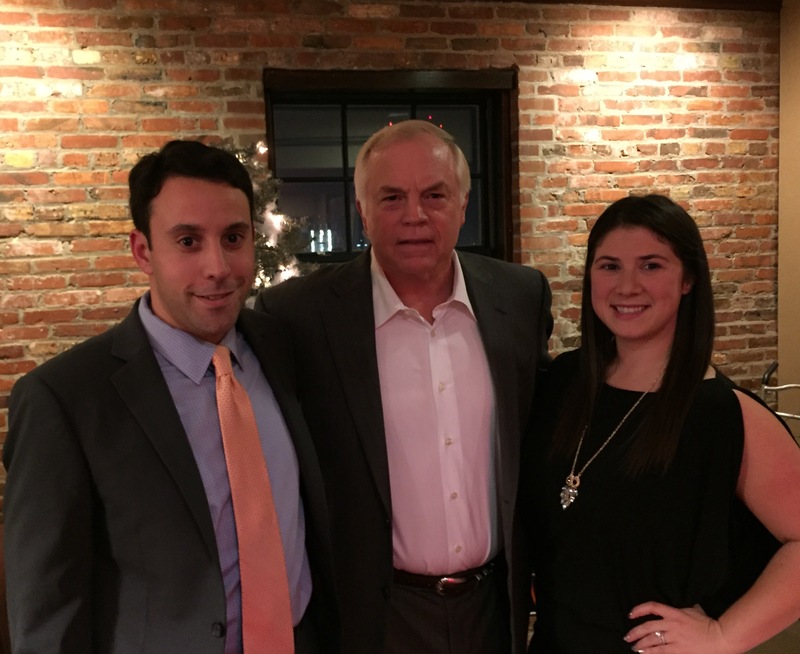 We snagged the below pic with O’s manager Buck Showalter. 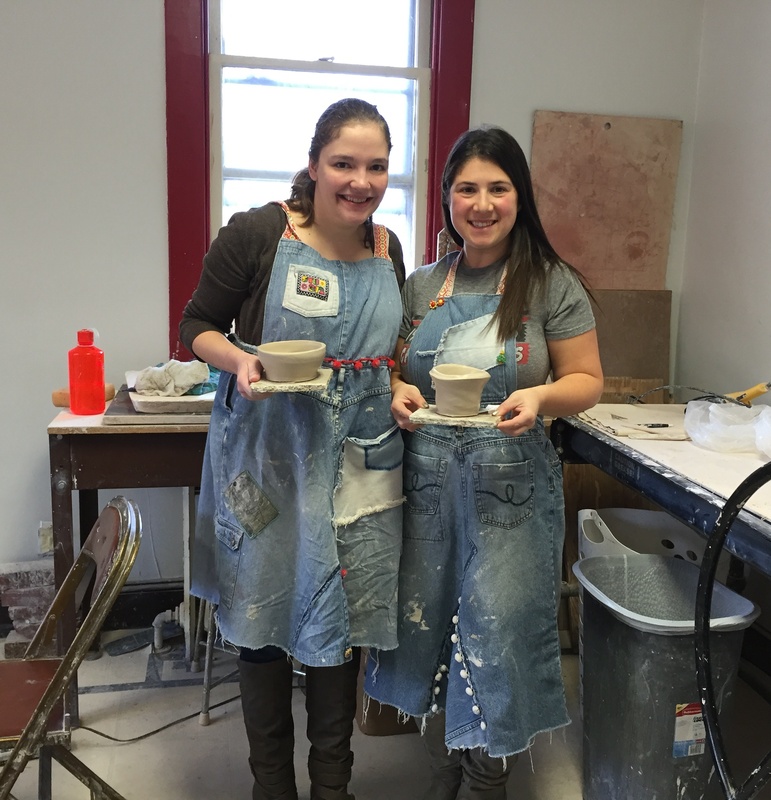 On Saturday, Jeanette and I went to a pottery class at the Clayground in historic Ellicott City. 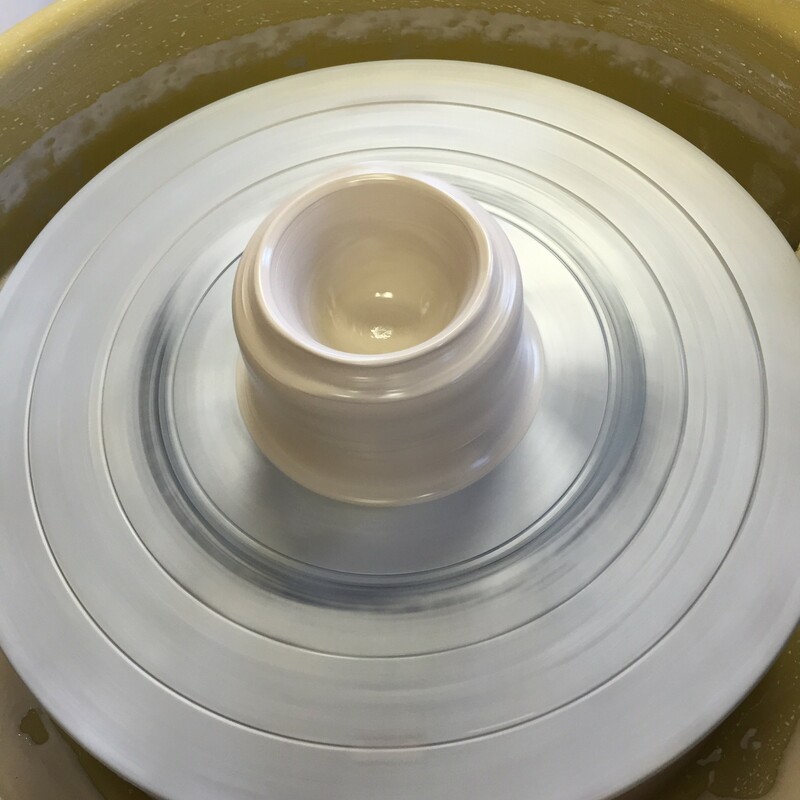 J had given me a groupon for two spots in a byob pottery wheel class and we had a blast learning the basics of “throwing a bowl.” There were only eight people in the class and our instructor did a great job of slowly explaining all of the steps. I can’t say my bowl turned out all that well, but I had a lot of fun and I’m excited to go back and glaze my bowl after it gets fired in the kiln. We followed our pottery class with lunch at a nearby sandwich place where I had a bomb turkey avocado sandwich. Sunday we had a holiday brunch potluck and my talented friends made some delicious food. Jeanette and I were in charge of drinks and struggled a little to make this cranberry prosecco cocktail (the syrup turned out way too chunky). 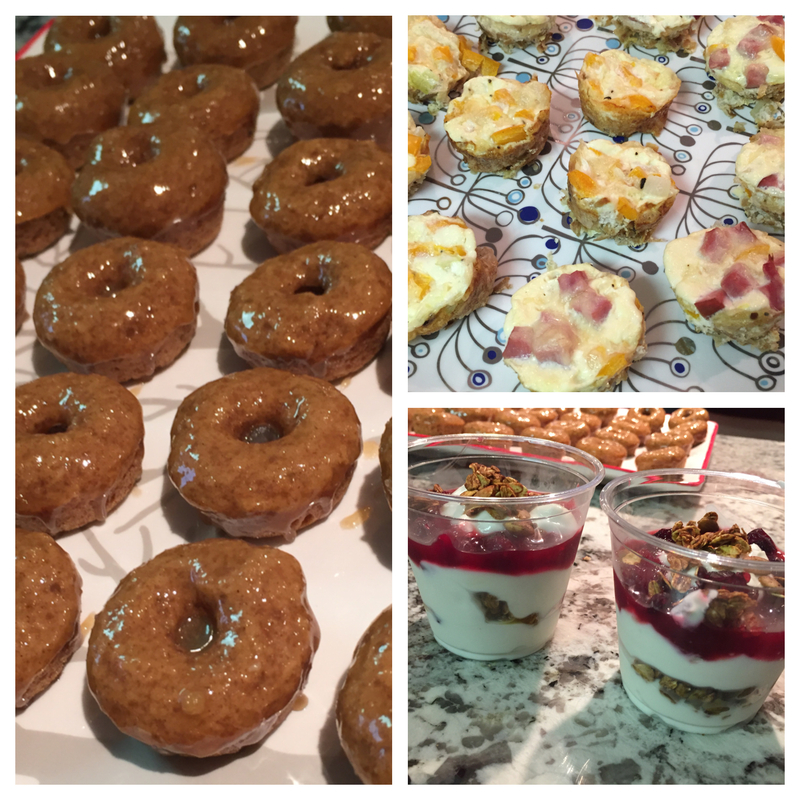 We munched on tiny gingerbread donuts, egg cups, french toast casserole and pumpkin jam Greek yogurt parfaits. We also watched Love Actually which is one of my absolute favorite holiday movies. My busy work week was also punctuated with a lot of food: pizza party and omelet bars in the office, holiday cookie deliveries and a team dinner at Cinghiale. 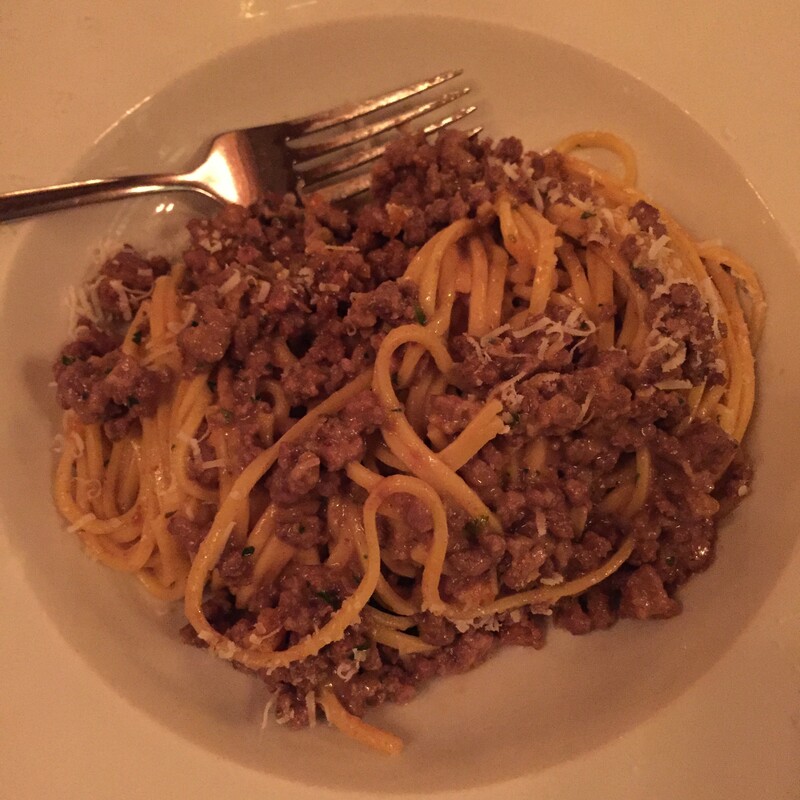 Our dinner was great – we started with wine and charcuterie and I had a delicious pasta with wild boar bolognese. And I think that just about catches us up on the last week’s activities. I laid low last night and watched Amy Schumer’s special. I don’t usually love stand-up but I thought it was really funny. Yay for funny women. 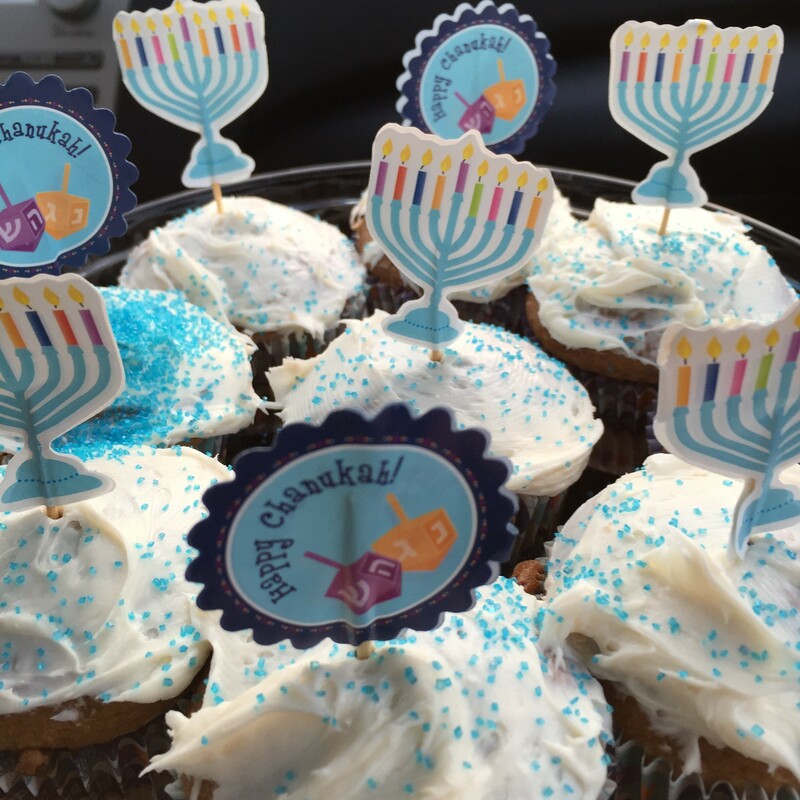 Oh and to complete this post with one more food pic, I made some Hanukkah spice cupcakes for a family gathering Saturday night. Like I mentioned, I was in South Carolina and enjoyed two Thanksgiving feasts with various aunts, uncles and cousins. 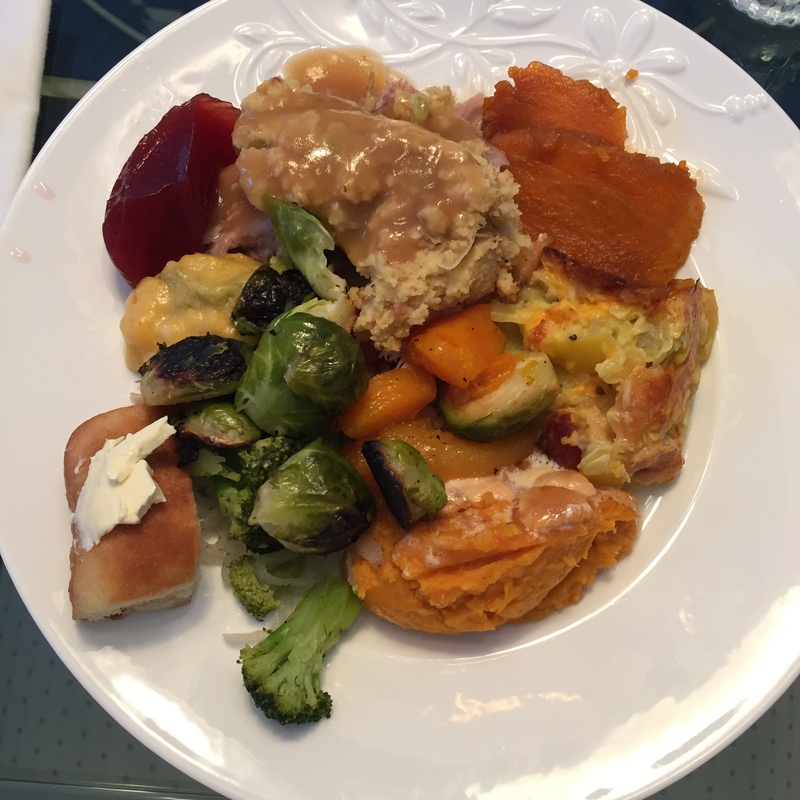 As always, the food was delicious with my faves being the candied sweet potatoes and the brussels sprouts and root vegetables. The desserts were also exemplary with my aunt’s using family recipes to bake a cheesecake and pineapple upside down cake. As per yearly tradition, second Thanksgiving on Friday included the addition of a green bean casserole which I always look forward to! We also went out for a couple delicious meals in Columbia: salmon and cheesy grits (they just never taste as good up north) at Mr. Friendly’s and a taco salad with pulled chicken from Cantina 76. 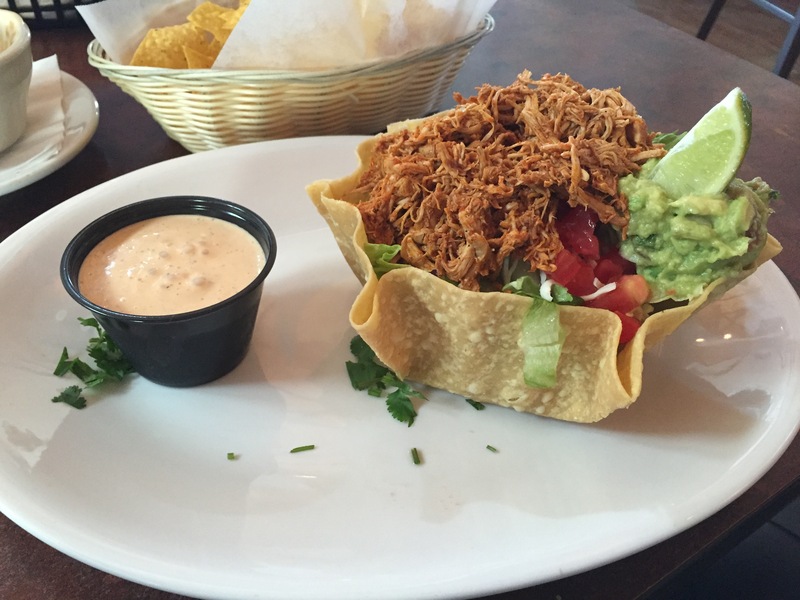 Cantina had a fairly limited menu compared to some tex mex places, but touted their extensive taco selection. 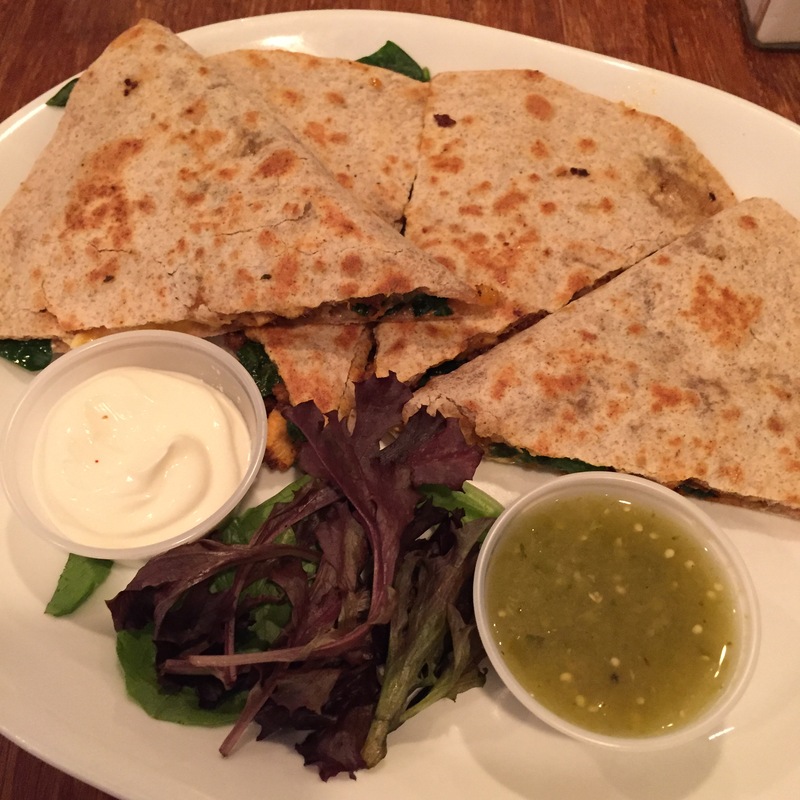 Adam tried a Thanksgiving taco with fried turkey and cranberry salsa, a Peruvian shrimp taco and a fish taco. He loved them all! With all the aforementioned food, we tried our best to do something active every day whether it was going for a jog or just a long walk. 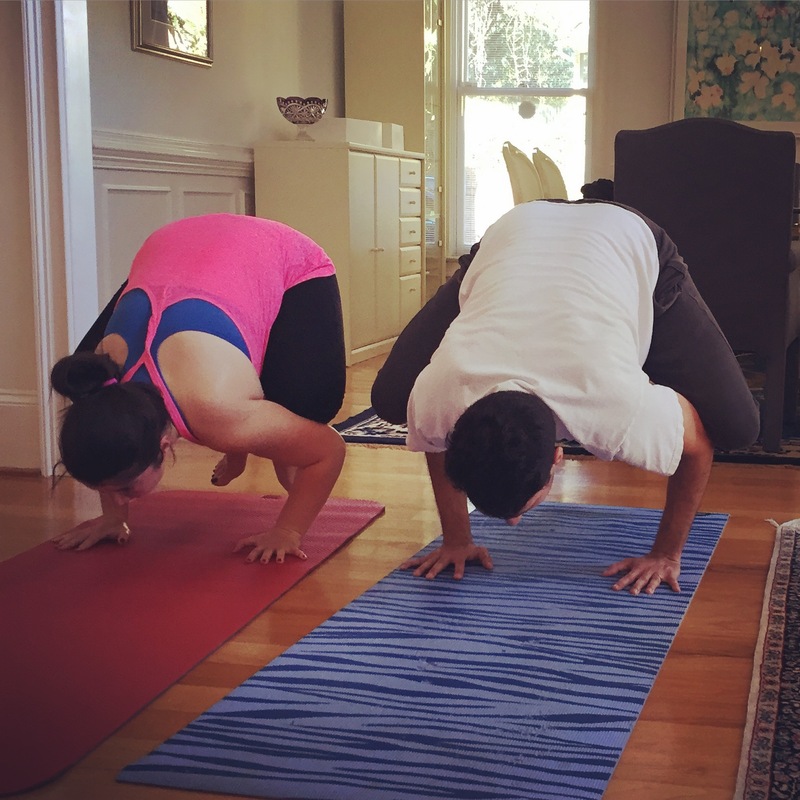 We also did a mini yoga class Thanksgiving morning since my cousin is certified as an instructor. 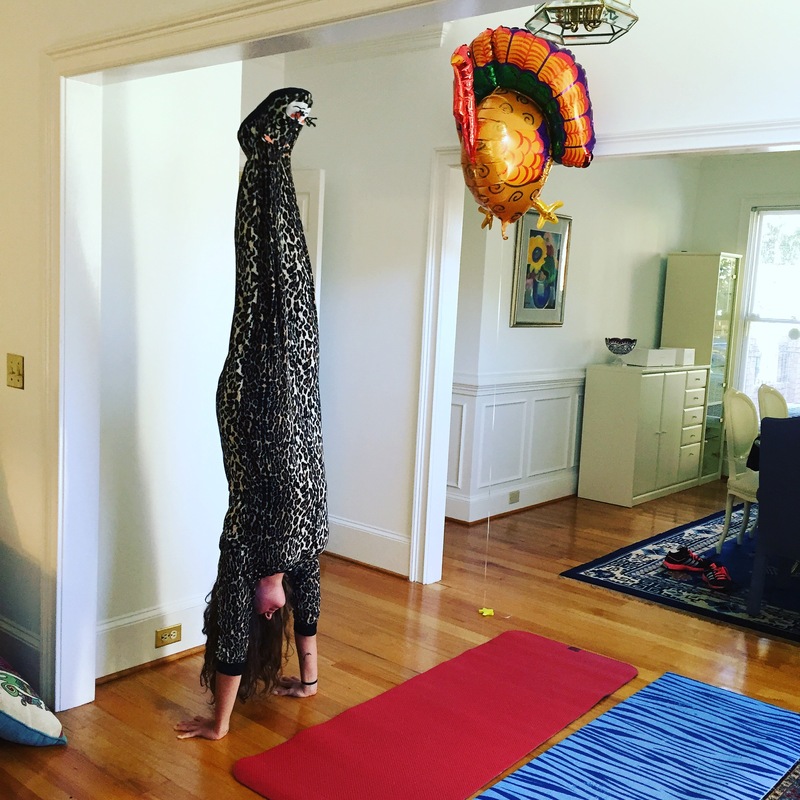 She showed off with handstands and helped us practice our crow (yes, I know Adam’s is better than mine). We also took the traditional post meal walk and took family photos. 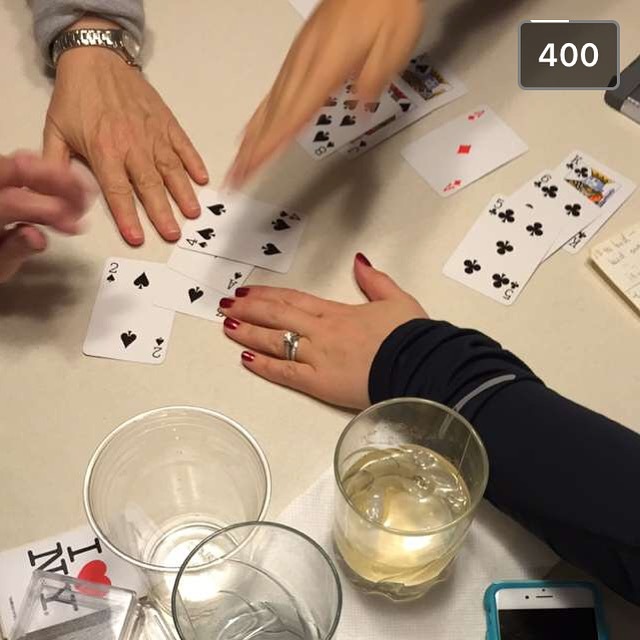 We are big game players in my family and there’s nothing we love more at Thanksgiving than hanging out around the house with a cocktail and a card game. We played a lot of bridge, apples to apples and a game called Vices from the 80’s that was essentially a dirty version of trivial pursuit. We came home from South Carolina on Saturday, just in time for Adam’s 10 year high school reunion at Barcocina. They had a nice private space and an open bar where I probably had one to many gin and gingers. We had a lot of fun spending time with Adam’s friends who were visiting from out of town. On Sunday, I met up with my friend Jessie (who you may remember from my trip to New York) for brunch at Spoons. Remarkably we were seated without any wait and enjoyed a tasty meal and some girl talk. Jessie had the pulled pork benedict and Spoons’ version of a Bloody Mary (made with sake) and I had a goat cheese, chorizo and spinach quesadilla (sans drink because of Saturday night’s open bar). 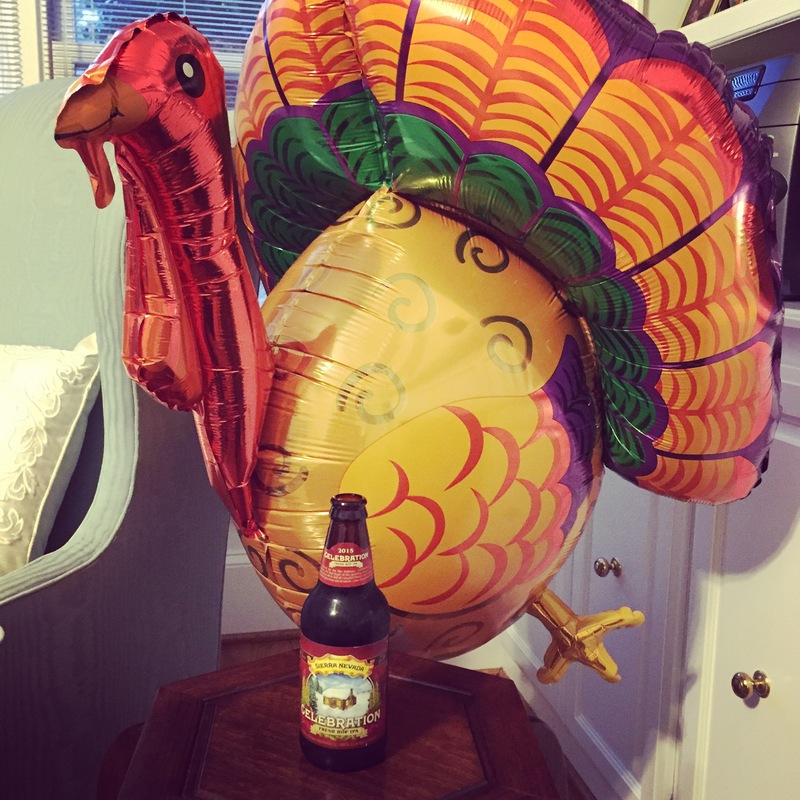 All of that fun plus some holiday shopping, laundry, cleaning and decorating the apartment made for the perfect Thanksgiving week! Now on to all of the holiday festivities that December brings to Baltimore! What was the highlight of your Thanksgiving? What are your special traditions?